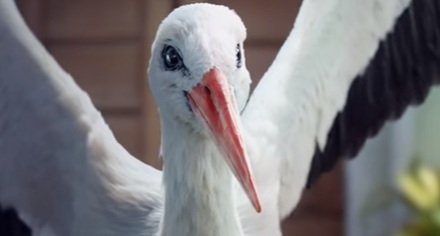 Fiat showcases the new Fiat 500L, the “grown up version” of the brand’s famous Fiat 500, in a hilarious ad, revealing why storks prefer the new Fiat 500L. “Quite simply, the new Fiat 500L is the only car the next generation wants. They will never settle for a normal family car: they only want the most stylish and fun car around. And since we want the very best for our children, the Fiat 500L is a choice we can make for them!” – this is the idea behind the 30-second spot, featuring a stork that leaves a baby in front of a house and then, seeing a Fiat 500L parked in front of the house across the street, takes the baby and leaves him there. The song playing in the background is the hit single “Close to You” by American duo The Carpenters, from their second studio album titled “Close to You”, released in 1970, that topped the Canadian Albums Chart and peaked at #2 on the US Billboard albums chart. The new Fiat 500L (introduced as “the baby limousine”) ensures you’ll enjoy all the beauty and iconic charm of the Fiat 500 in a comfortable, spacious family car, according to the Italian car manufacturer. Boasting a restyled exterior design with iconic new detailing, the baby limousine also ensures safety through its airbags, Autonomous City Brake system and Electronic Stability Control system, including also ASR/MSR, Hill Holder, ABS, ERM and DST, so that you could have full control in emergency situations.